(Hauppauge, NY) Online Marketing Muscle announces that their President & CEO, Dean Mercado has achieved “Infusionsoft Certified Partner” status on their behalf, giving them exclusive rights to resell Infusionsoft software. In addition, the company now offers consulting packages including Infusionsoft services to assist small businesses looking to improve and automate their sales and marketing processes. Companies taking advantage of the service find they obtain the right solution to help them achieve the quickest path to higher profits. “Infusionsoft automates one’s business, and companies find they are able to schedule tasks, manage contacts and more, all with the help of a single system. With automated follow-up, companies find they grow their sales opportunities and convert leads into customers more consistently. In addition, hot prospects are easily identified with the help of the program, and sales can be closed faster. When companies sell more, they earn more, and this is only one reason why every business needs Infusionsoft,” Dean Mercado, spokesperson for Online Marketing Muscle, explains. The key to operating a successful business presence online lies in being creative. The Internet continues to grow in leaps and bounds, and getting noticed becomes harder every day. To attract the attention of the average consumer, one must find ways to gain their attention and then keep it. As Statistic Brain reports, the average attention span is 8.25 seconds and 17 percent of Internet page views last less than four seconds, thus companies must find unique ways to entice a visitor to continue reading. “Businesses struggling in this area need to focus on enticing consumers, yet this can be hard to do when they must focus on tasks which could be automated. With the help of Infusionsoft, this becomes less of an issue, as the program takes on the routine tasks, leaving employees more time to come up with new ideas and techniques. If a company needs assistance in this area, Online Marketing Muscle can be of help,” Mercado continues. Online Marketing Muscle offers two ways for clients to obtain the help they need. Some opt to do the majority of the work themselves once they know what to do. Others wish to have the work done for them. Either way, a client obtains the help they need to increase sales and profits. “We clearly see the reason why Infusionsoft is taking the small business community by storm. Once it has been properly adopted and adapted by a small business, life while different, becomes more manageable and effective. We have not only experienced this with our own business, but with our Clients who have taken on this transformative process as well. 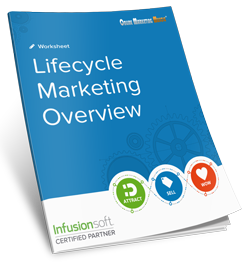 This is why Online Marketing Muscle prioritized becoming an Infusionsoft Certified Partner,” Mercado declares. Want Better Results From Your Sales & Marketing? Learn about the same system that over 30,000 small businesses worldwide use to help them succeed!